The Chinese Communist Party may finally be getting out of the family planning business. Three years ago, the party scrapped its infamous one-child policy. Last month, Bloomberg reported that China’s State Council is mulling ending birth limits altogether. The damage to China’s demographic outlook done by tight population controls has been immense – and it may take several generations for the country to recover. When Deng Xiaoping’s government implemented the one-child policy in 1979, population control was all the rage across the globe. Amid booming population growth in the years following World War II, some demographers were warning that the human race was about to breed itself into extinction. Most famously, Stanford professor Paul Ehrlich’s 1968 best-seller The Population Bomb warned that hundreds of millions of people, mostly in the developing world, would starve in the 1970s alone. This, of course, turned out to be wildly off the mark. Among other failures, it did not anticipate extraordinary advancements in agricultural technology and mechanization. The famines that did occur were primarily caused by age-old scourges like war, political instability and gross policy mismanagement. But for China, the threat was all too easy to visualize. A decade earlier, between 23 million and 55 million people starved to death during the famine that resulted from Mao Zedong’s Great Leap Forward, and collectivization had left the country’s agricultural sector in tatters. Meanwhile, China’s population was exploding, growing by about 20 percent annually in the years since the Communist Party had won the Chinese civil war. To stave off another disaster, the party turned to its most tried and true policy response: tightened control over even the most intimate affairs of its people. Today, China has become a victim of its own success. In 1980, Chinese population growth, measured as the crude birthrate minus the crude death rate, had reached 15 per 1,000 people. By 2015, when the one-child rule was lifted countrywide, this had dropped below 5.5 per 1,000 people. Fertility rates today are estimated to be around 1.7 children per adult female, well short of the 2.1 replacement rate. In fact, fertility rates have been below replacement levels since the early 1990s, bottoming out at just 1.18 in 2010. This means that the average Chinese citizen is getting older, fast, and this trend is expected to pick up speed beginning around 2030. According to China’s National Development and Reform Commission, China’s working-age population (those aged 16 to 59) will fall more than 23 percent to around 830 million by 2030 and 700 million by 2050. By then, a full third of the Chinese population will have reached retirement age, compared to around 15 percent today. Making matters worse, fertility rates haven’t increased substantially since Beijing decided to allow families to have a second child three years ago. In 2016, according to official figures, 18.46 million Chinese babies were born, nearly 2 million more than the previous year and the highest number since 2000. Nearly half were born to families that already had a child. But things came back to earth in 2017, with births plummeting some 3.5 percent to 17.23 million, nearly 3 million short of official forecasts. The problem for China is that government policy hasn’t been the only thing keeping birthrates low. The one-child policy has, in many ways, become self-sustaining. In Chinese culture, people are generally expected to take care of their parents when they reach their golden years. This means average Chinese households will be expected to take care of four parents – and have no siblings to share this burden with – leaving less time and money to raise kids of their own. This, combined with factors like career pressures, changing social pressures, the lower birthrates that generally coincide with urbanization and so forth, means Chinese couples have become less inclined to have more kids even if allowed to. According to the Population Research Institute of Peking University, “fertility desire” – the number of children the average Chinese adult female wants (or believes she will be able to afford) – is between 1.6 and 1.8. A shrinking, aging population poses problems for any country; China’s size and position on the development curve simply make them more acute. For one, it means a lot more retired people to take care of – and fewer working-age people to shoulder the burden of rising pension payouts, health care costs and so forth. In China, the dependency ratio (the number of people too young or old to work divided by the working population) is expected to surge to nearly 70 percent by 2050, compared to just more than 36 percent in 2016. In other words, there is expected to be 1.3 workers for every retired person by the middle of this century, down from nearly three today. Even if the end of the two-child policy compels Chinese couples to start having substantially more children, an immediate bump would actually make the dependency ratio worse for another 15-20 years (in other words, until those newborns enter the workforce). Magnifying this problem are macroeconomic challenges. For example, a shrinking population means declining consumer demand and output. Tighter labor markets drive up wages, making export-oriented industries less competitive – a major concern for a manufacturing-dependent country like China, whose economic rise is fueled by abundant low-cost workers. To a degree, health care advances that enable people to live and work longer, combined with technological advances that enable the Chinese economy to sustain productivity with fewer workers, will help soften the blow. This, in part, explains Beijing’s hearty support for emerging technologies – such as self-driving cars, robotization and artificial intelligence – that will inevitably displace workers in the short term. 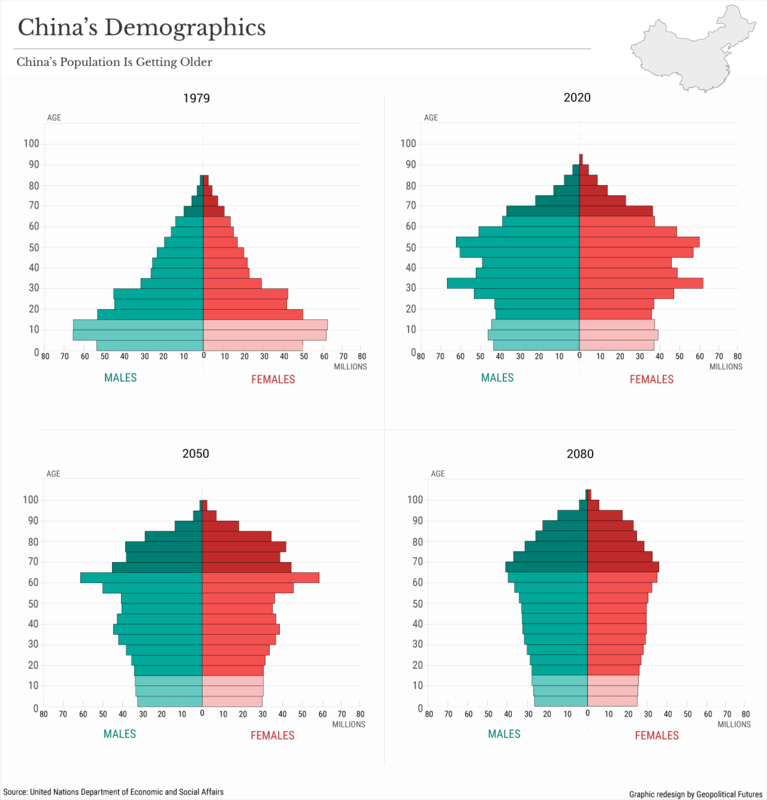 Nonetheless, the demographic outlook is expected to be yet another drag on China’s continued economic rise. Projections at this time-scale are bound to be inexact, but the International Monetary Fund forecasts that demographic pressures will reduce Chinese gross domestic product growth by 0.5 percent to 0.75 percent over the next three decades. According to the Organization for Economic Cooperation and Development, demographics is a major contributor to what it expects will be a sharp decline in economic growth beginning in the not-too-distant future. Between 2030 and 2060 (the same period when the Chinese government expects to see the sharpest drop in the working-age population), the OECD forecasts just 2.3 percent annual growth, down from an estimated 6.8 percent last year. China isn’t alone in this challenge. South Korea, Japan and a number of Western countries have comparably low fertility rates and shrinking, aging populations. (Every day in Japan, the world’s oldest country, nearly a thousand more people die than are born.) But China is different in four main ways. First, this trend is happening faster in China than elsewhere. The slice of the Chinese population made up of retirees will jump from less than 10 percent to a full quarter in just 25 years. In Western countries, this shift has taken place far more gradually, generally over a century or more. China will have far less time to adjust. Second, it’s happening earlier on China’s development curve than any other major economy. In other words, China is growing old before it grows rich. When Japan reached the percentage of retirees China has now, per capita incomes were double those of China today. When South Korea crossed this threshold, incomes were nearly three times as high. This meant more money to sink into eldercare in aggregate, plus fewer one-child households left holding the bag. And even these countries are still struggling to cope with the rising social costs and economic stagnation tied to demographic decline. Third, at least compared to Western countries, China has never been particularly receptive to immigration. The United States’ ability to attract and absorb immigrants is an enduring source of national strength, occasional political spasms over the issue notwithstanding. China has no tradition of attracting foreign immigrants; just 1,576 foreigners were granted permanent residency in China in 2016. And it’s unclear how the country’s rigid systems of social control would adapt to a major influx of outsiders. Finally, China’s political-economic balance is far more precarious than that of more developed economies. The benefits of its economic rise have not been shared equally between the coasts and the interior. For a variety of other structural reasons, economic growth is already expected to gradually slow over the coming decades; demographics will make the challenge only more difficult to manage. Making matters worse, the one-child policy led to an explosion of gender-selective abortions, creating a sizable imbalance between the sexes. By 2014, there were 41 million more men than women in China – and this gap is widening. In other words, there will be tens of millions of males with poor chances of marrying and looking for an outlet to vent their frustrations. In fact, after it lifted the one-child policy in 2015, the government saw a wave of protests by couples demanding compensation for being denied the right to build a bigger family. In a democratic country, mass social and economic dissatisfaction may lead to the fall of a particular government, but in democracies, governments come and go all the time. To the Communist Party, the threat of social unrest is existential. The public tolerates the party’s tight social controls so long as it continues to deliver on its pledge to make the whole country a modern, vibrant state. In this climate, even a modest economic slowdown could reverberate in ways that threaten to make the whole project come undone. — China: Growing Old Before It Can Grow Rich originally appeared at Geopolitical Futures.